Applicants to posses with 10 years of experience. Selection Process is: Walk-in Interview. 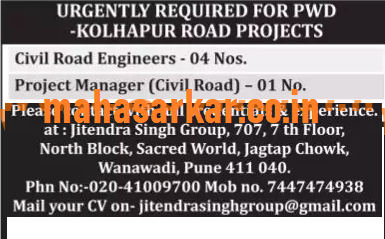 jitendrasinghgroup@gmail.com OR Jitendra Singh Group, 707, 7th Floor, North Block, Sacred World, Jagtap Chawk, Wanawadi, Pune – 411040.